President Trump gives his first State of the Union address to Congress in January 2018. 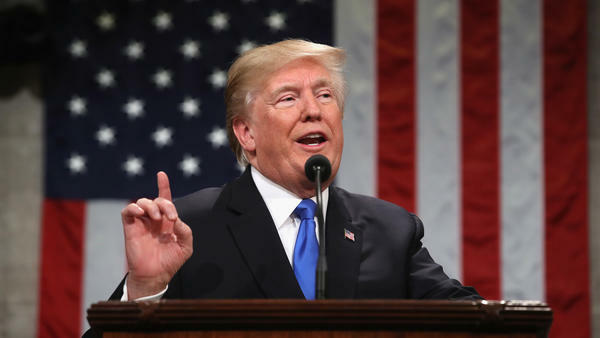 President Trump will deliver his second State of the Union address to Congress on Tuesday night. He's expected to deliver a bipartisan message themed around "choosing greatness," while outlining what the White House calls a "policy agenda both parties can rally behind." Trump's address will begin at 9 p.m. ET (you can watch and listen via NPR). His remarks will be followed by two responses: former Georgia gubernatorial candidate Stacey Abrams will deliver the Democratic response, and California Attorney General Xavier Becerra will give the Spanish-language remarks. The tradition of the speech traces back to the Constitution, which calls for the president to "from time to time give to the Congress Information of the State of the Union." The televised responses began in 1966. Trump is set to outline his agenda while facing a new reality: a House chamber controlled by Democrats. 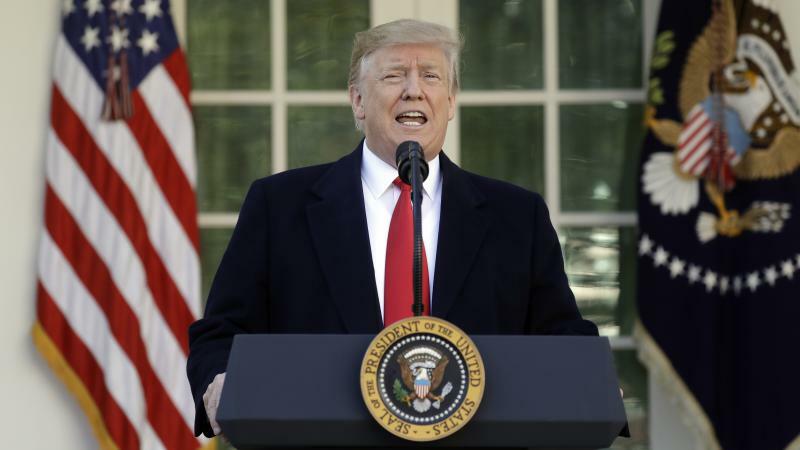 While it's likely he will reiterate his demands for billions of dollars in funding for a wall along the southern U.S. border, Trump could also use the address to make a pitch for more bipartisan issues, including health care, infrastructure and economic growth. Also notable during Trump's speech? Who's there to watch. People on different sides of the immigration debate, climate change experts and federal workers affected by the recent government shutdown are among lawmakers' guests. After Trump's speech, Abrams will deliver the Democratic response. Seen as a rising star within the Democratic Party after her 2018 gubernatorial campaign, she's considered a possible challenger to Georgia GOP Sen. David Perdue in 2020. Democrats will look to jump-start their legislative agenda after the State of the Union after facing a delay due to the partial government shutdown. House Democrats have begun introducing a series of bills, including legislation aimed at closing the gender pay gap and a bill to overhaul campaign finance and ethics rules. Things started off in a normal fashion — on Jan. 4, newly minted Speaker of the House Nancy Pelosi, D-Calif., invited Trump to deliver the State of the Union in the House chamber on Jan. 29. But that's where "business as usual" stopped. On Jan. 16, Pelosi sent a letter to Trump calling for the speech to be postponed until the shutdown, which had begun on Dec. 22, was over. In her letter, Pelosi cited "security concerns," as the U.S. Secret Service and Department of Homeland Security were both affected by the shutdown. Homeland Security Secretary Kirstjen Nielsen dismissed those concerns, and Republican lawmakers were quick to slam Pelosi's decision. In what appeared to be a retaliatory move one day later, Trump postponed a congressional delegation's trip to Afghanistan at the last minute, writing, "I am sure you would agree that postponing this public relations event is totally appropriate." "I also feel that, during this period, it would be better if you were in Washington negotiating with me and joining the Strong Border Security movement to end the Shutdown," Trump wrote to Pelosi, who was on a bus with other lawmakers departing for the trip when the president sent his letter. The back-and-forth escalated from there, with Pelosi's office accusing the White House of leaking the delegation's plans to complete the trip via commercial travel. The White House denied the allegation, calling it "outrageous." Trump later took to Twitter, saying he was "still thinking" about the speech and indicating he was prepared to give the speech in the House regardless of Pelosi's urging. White House officials confirmed as much, telling NPR they requested a security walk-through as though the speech would still take place on Jan. 29. That prompted Pelosi to send another letter to the president, this time more forceful in her language. "I am writing to inform you that the House of Representatives will not consider a concurrent resolution authorizing the President's State of the Union address in the House Chamber until government has opened," she wrote. Later that evening, Trump acquiesced, tweeting that he would deliver the address "when the Shutdown is over." Just two days later, Trump signed a bill to bring a (temporary) end to the 35-day shutdown, and the following week, Pelosi extended an invitation for Trump to address Congress on Feb. 5. NPR will offer a livestream of Trump's speech and the Democratic response on NPR.org and both the NPR and NPR Politics Facebook pages. We'll also air live special coverage of the remarks and analysis after the speeches. Find your local NPR member station here. Following the address, the NPR Politics Podcast team will hop in the studio to record a new episode. Not subscribed? Here's where you can find and subscribe to the show. The president's annual State of the Union address — which had been delayed this year because of the partial government shutdown — took place Tuesday night. Following the president's annual State of the Union address Tuesday night, Georgia politician Stacey Abrams delivered the Democratic response. President Donald Trump addressed the nation Tuesday night from the Oval Office. Following the president's speech, U.S. House Speaker Nancy Pelosi and Senate Minority Leader Chuck Schumer issued a joint Democratic response. 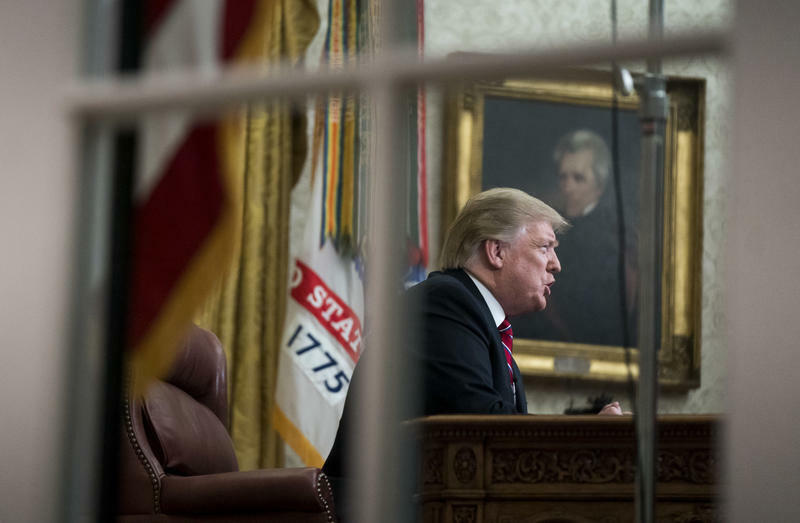 President Trump delivered the first Oval Office address of his presidency Tuesday night — and it came in the midst of a protracted partial government shutdown. There were a lot of questions going into the address, but there were at least as many afterward — especially, and most importantly: What now?